Homeschooling is not for the faint of heart. In fact, it’s just plain hard. 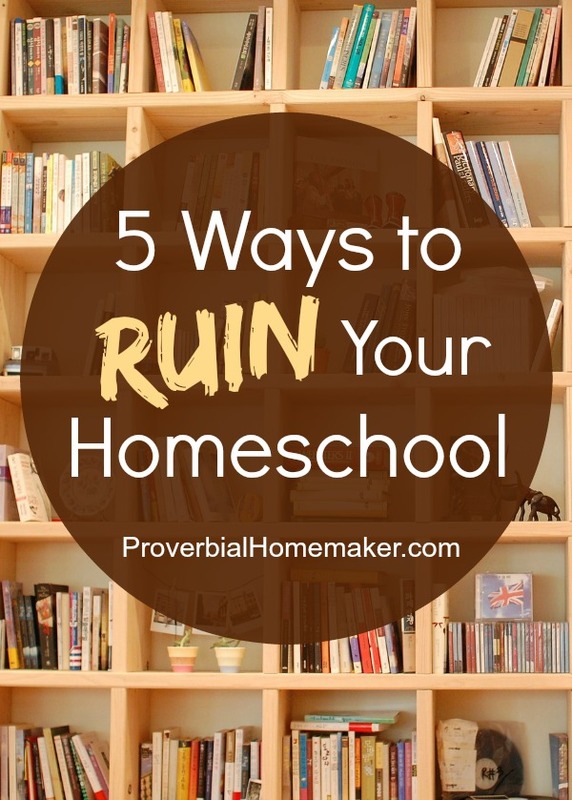 Still there are some pits you can identify and deal with – 5 ways to ruin your homeschool that you can deal with and exchange for joy! There are so many challenges that they are likely to make your head spin. You are teaching three levels of students, putting dinner in the crock pot, trying to keep the toddler alive, planning curriculum, tending the garden, answering the door (no, we can’t come out to play again), and nurturing eternal souls for the sake of Christ. That’s just before lunch. Of course, you love homeschooling! You know this is the right thing for your family and you are following God’s lead. However, there are times when the joy just isn’t there. The obstacles seem insurmountable and you can’t seem to do anything but just survive the day. Joylessnes. That’s not where you want to be, is it? It sure isn’t what God has intended for this crazy wonderful homeschool journey. When I find myself in this state of joy-less homeschooling, I know it’s because I’ve fallen into one of these five pits. We play tapes in our heads all the time, telling ourselves some version of reality and making choices every day about what to believe. What tapes are you playing in your head? Are they lies like these? Lies, all of them. I’m sure you have your own lies playing on your tape on the hard days, don’t you? What lies do you allow yourself to believe in those moments when the only thing that matters is the truth? Capture those thoughts for Christ, my friend! They aren’t from Him. Instead, cover yourself, your children and your homeschool in truth by praying the scripture over it all. Combat each lie by identifying the truth that demolishes it, then make that your new tape. We see the mom who seems to be confident in her homeschooling. She has all the answers, a list of curriculum choices for the year, and an amazing ability to juggle 5 kids, a ministry, a marriage, a household, and then she raises chickens just for fun. We’re lucky if the laundry gets moved over before it starts to get funky. Bottom line: God didn’t choose her to raise these kids. These kids are placed in your care for a reason and God has great plans for you. Yes, learn from others and be inspired by their example – whether it’s a blog post or a conversation with the homeschooling Joneses – but set aside comparison. Comparison will eat your joy for breakfast. Instead, remain in the truth that God designed your family perfectly, and there’s nobody to keep up with. Keep your foundation firmly planted in Him and you cannot go wrong. When you’re on a plane and you’re watching the pre-flight safety instruction, the flight attendant will tell you to put your air mask on before helping a child. There’s a reason for that! In homeschooling as well, you cannot run yourself ragged and expect to take good care of your kids. You certainly won’t be able to give your best to your family! Taking reasonable care of yourself is important, and by doing so, you are actually putting your family first. Find time for rest and reflection. Be with God daily in His word. Taking care of ourselves physically, emotionally, and spiritually are all critical for the task of homeschooling. Care for yourself as an act of obedience to God and service to your family. Plans are good and flexible, and routines are even better. Finding our groove is important in our homemaking and homeschooling. I have had such an uphill battle in this area, but it is worth it! However, clinging to our plans is not healthy. If we put too much stock in our schedules and plans for the day, let alone the whole year, we will be left with disappointment. Being flexible is just as important as having some order to our days! Hold loosely to your plans and trust God to guide you in whatever changes you need to make for your family. When things go south, many of us homeschooling moms tend to just take a deep breath and pull ourselves up by our bootstraps. We carry the success of our homeschool on our own shoulders and don’t seek out help from others. This isn’t how it should be! It’s good to be able to pick up after a disappointment or a change in plans and keep moving forward. Living as if we are doing this all on our own efforts is not the same thing! First, the Lord is our daily help and source of encouragement. How often are we really on our knees in prayer in planning for our homeschool, or when navigating those rough days? Second, we can find (or pray for) friends and other homeschoolers to walk beside us in this journey. Which Pit are YOU In? Dear homeschool mom, we don’t have to stay in these pits. God has this covered we can trust Him to save us out of them. Relaxation for Moms – here are some fun things to try! I am a grandmother who will begin homeschooling (3rd grade) in the fall of 2016. I really enjoyed this overview of little pitfalls that will, in all likelihood, appear from time to time. Your approach and description has really helped me as I prepare for this fall. In my head, I have an approach to homeschooling all mapped out, but in reality, I know it will all go south after one day. Having this summer to prepare myself for constant change – flows and ebbs of homeschooling – is a blessing. I’m so glad Nina! Bless you and your work with your grandkids! Just starting out asking Him to help me have the right perspective each morning and make sure I get up BEFORE the munchkins is one way today that I can focus on my walk with Him! I’m not a homeschooling mom, but I’m a busy, overwhelmed grandmother who works fulltime and I have my granddaughter 3/4 of the time. It’s a bit overwhelming to suddenly have school, homework, extracurricular activities, daycare and all sorts of things to deal with again. I really need to regain my focus and make some time for myself to relax and recharge. It is so easy to believe the lies. Tge hard one for me lately is we aren’t doing enough. We have had a lot happening lately and school took a bit of a back seat. We are back on track now, it was hard though. I just make a cup of green tea & sit down & relax. Think about my day & things I am grateful for. Today was one of those ‘believe in lies’ day. I asked God to show me some encouragement & He had this show up as the very first thing on my computer!! I definitely need to relax! I need to spend more time in God’s Word. In fact, this morning, I was so absorbed in my Bible time that I completely missed my prayer time with my husband. I think that is definitely a sign I need to spend more time studying! Leaning into God’s grace through prayer helps me daily. Relaxation? What’s that??? Ha! Fortunately my family lives next door to my parents, so each Friday my son goes swimming at the local YMCA with my mother and spends the day with them. I take the time to run my weekly errands in town (mini-vacation!) and then I come home and catch up on a couple of my favorite shows online. We must do anything we can to get that much-needed MOMMY alone time! 🙂 Thank you for your blog! I am so stressed out with Adrenal Fatigue and 3 little ones. Today I started re-reading My Utmost For His Highest and it was so refreshing! Laura I am in the same boat…adrenal fatigue and hypothyroidism…with a 5 year old and a 17 year old. Can’t I just stay in bed all day?? 🙁 BUT I’ve been feeling better lately with essential oils! Have you tried the oils for Adrenal Fatigue? Of course! I think all moms could use a moment to relax. With friends, reading a book, some great tea or even a nap! This would be the ultimate!!!! I definitely need to relax. I don’t remember the last time I had time to myself. I am either doing homemaking, being a wife, being a mother, being a caretaker for my disabled brother, etc. I have fallen out of the habit of starting my day with prayer and meditation and then continuing my day with constant contact with Jesus. I definitely need to reinstate my morning prayer and meditation. I know I have to make my time with the Lord a priority or it will take a back seat to less important things. This relaxation kit would come in handy! I am very ready for summer break and fun! I have a lot of reading to do on calming my anxiety and my hope is more of my own quiet time with my bible can help as well. How wonderful, I have homeschooled my 3 kids, my oldest is 36 with 3 childern and they are homeschooling, my second is 35 with 3 childern and they are homeschooling, my youngest is 16 and I am still homeschooling. I have loved it but it is nice to take time to relax. Yes I need to relax!!! 3 kids 5 and under!! Whew! This would be perfect for me. Baby number 6 is due in a few weeks and I have always found it challenging to find me time and just relax. Don’t we all need to relax? 🙂 I usually listen to worship music and try to carve out time to journal and read the Bible and a good devotional. I need to desperately get back into a bible study routine and I’m hoping that it’ll help the post-partum issues I’m having. What a neat giveaway!! What a fabulous giveaway! These are wonderful gifts. I love the coloring books. I have always colored for relaxation, actually. I have a collection of precious moments coloring books from the early 90s that I’ve been slowly using. I was so excited when the new adult coloring books started appearing. I’m trying to be more intentional about praying to improve my relationship with my Savior. I tend toward easily distractable. I definitely need to relax. Homeschooling mom of 5… two happen to be teenaged girls that are pushing me to my breaking point! I think waking up before the kids, hot cup of tea and time to pray/study would help guide elme through this testing time. Thank for the chance to win this amazing giveaway! The day I put myself in the running for worst mom of the year this shows up in my feed. Coincidence? I think not. Yes, I can get burned out on homeschool….the two that I struggle with the most are putting myself last and clinging to the plan. I try really hard to work through them and could really use this prize to help me relax and take care of myself. I know that I need to pray more and completely submit our schooling to Him. Hopefully next school year I can put these steps in to practice more often. This give away comes at a wonderful time. Summer !!! We all need to relax, especially us older folks. Dear Lana, your comment touched me and I will be praying for you. May you see God working in your life and grow ever closer to Him. You are precious to Him! I am most relaxed when I am daily giving God control of my life and remembering that He is good “ALL” of the time in every circumstance. Replacing the lies of the enemy with the truth of God’s word is so true! Tauna, I am always so encouraged and feel ‘spurred’ on by your posts. Thanks for encouraging this mama! These 5 points were home runs. Each one hit home in some way. Thanks again! Absolutely I need a chance to relax! A cross country move at the end of the school year is a bit stressful and requires leaning on Him more than ever. I can’t start my day without prayer. Thanks for this giveaway. I need to remember to ask the Lord each day to guide our schooling and help me to focus on what is important (like character). He designed each of my children to be what He wants them to be – I need to remember that and help them discover who they are in God’s sight. This will be my first year of homeschooling. I’m looking forward to it, but it’s kind of intimidating at the same time. I know this is the way that God has been encouraging me to go, so looking to him as I go forward. With the school year ending, I am ready to relax some. Our God is awesome and faithful. I have learned to lean on Him daily, even hourly in this journey of homeschooling. I appreciate your blog as it is very encouraging to the spirit as well as practical. This giveaway is amazing! Thank you so much for offering it. To grow closer to the Lord, I need more time in His Word. And it really helps if I write down a Scripture from the morning and post it in the kitchen or carry it with me, so I can remember what He showed me. Otherwise I forget too quickly and start to tell myself some of the lies you mentioned in the post. Relax sounds like a far off goal some days. I have to make sure to set aside specific time to spend with God each day. Also being intentional about playing music, etc is great and helps too. I need to rediscover the joy in homeschooling. I find myself losing patience as well as feeling like I am hitting walls when it comes to it sometimes. I would love to create and get into a Bible study routine where I get up and read the Word first instead of facebook or going thru emails. I love to color–used crayons and coloring books when I was pregnant with our oldest but seem to have no time to do it anymore. I need to draw on Gods strength through His Word more often. I know it affects my attitude and sustains me. I usually try to relax with a good book and some tea. But maybe the scriptural coloring books will work. I am newly pregnant and am coping with a stressful job change plus a location change of our building. This would be a wonderful giveaway to win! I try to spend time in the Bible, but unfortunately in this sinful world that gets pushed aside because we get way too busy with life. That needs to change!! Thank you for blogging! I always enjoy what you have. This giveaway look incredible too. Thank you! One thing that helps me relax is to take a walk around our farm. It also gives me time to pray and focus on God’s creation. I need to do it more often. Such an awesome give away, full of wonderful goodies to surely help relax! I always need to relax! I lead a very full life right now, which is full of mostly good things (and cleaning bathrooms), but sometimes I have to remind myself that it’s okay to slow down. What a timely giveaway as the end of our school year has finally arrived. This prize would be great to relax with over the summer! Thanks! Thanks for the idea too even if I don’t win! I definitely need to relax. Spending time with the Lord in prayer and Bible study and listening to encouraging podcasts while I work around the house help keep my focus on Him and helps me keep the right perspective. I’m focusing on truly resting in the Lord. Taking time to savor His word, pray and just be still! I probably slip int all of the above at one time or another. I will tell you though, that this comment about taking care of myself hit me hard: “Care for yourself as an act of obedience to God and service to your family.”. Never have I thought of it exactly like that. Thanks for that important reminder. My health and obligations ate getting in the way of my quiet time, even though I know that is the most healing thing I could do. What a nice way to start a morning! Relax; yes, everyone in my home could use to do that! Today I want to relax by taking extra time treasuring the gifts God has given me and thanking him for the amazing people he has placed in my care! I have realized that I have to take a few minutes to relax, focus, and read a short devotional. I can tell if I skip that time after a few days! These gifts are a wonderful encouragement! When I can have a reason to sit and relax, these would be the reason! Thank you for the chance to win these. I need to establish and keep quiet time and learn to let go of things I can’t change or have no control over. Looking through the items, I’ve already thought of ways to use them and also others to share them with who need some of that relaxation help as well. Thanks for your helpful articles. They are very encouraging. Thanks for your blogs. They are very encouraging. I am a grandmother who homeschooled her children and hoping to continue the tradition with my two young grandchildren. I still have older children living in the home as well. I feel I need to really get back on track starting my day EARLY with my morning meetings with my Heavenly Father. Over the winter, I woke between five and five thirty am and would meet God with a cup of coffee, my Bible and journal, and a candle. Now I still wake up at the same time, but more often than not, I find myself rolling over and going back to sleep. I need to get back into the habit, I felt so much closer to God and incredibly, NOT as tired when I arose earlier! Thanks for the opportunity for such a great giveaway. Love this encouragement. I don’t home school but am very domestically challenged and it’s so great to get positive encouragement and ideas from a Christian perspective. After 14 years of homeschooling,, I have learned the value of holding loosely to my plans. Plans are good and necessary but allowing life interruptions, especially when a family member or friend is in need of help, will help round out the children’s perspective of what our priorities should be. Just making our kids smart isn’t enough. They must also value people and learn to serve others. I like to run a hot bath after the kids are in bed. It’s my time to read the Bible and relax. It’s not an every night thing but I wish it was. This would be wonderful to win! Thank you for this giveaway! I am helping take care of my grandchildren & while they are great, I do need some relaxation! What an awesome giveaway! Would really love this! This is the end of my 3rd year homeschooling and the most important lesson of the ones above that I’ve learned is to hold the plan loosely! I like to be organized and am definitely a check-off-the-boxes sort of gal, but I now have a system in place that allows for some flexibility and changes in plans without me feeling guilty or stressed about it! Praise God for that breakthrough, as well as a husband that reminds me to just do my best and leave the rest in God’s hands. Come the end if the year I feel I need to relax. To breathe and just trust the Lord with the plans before me. I sit daily with Him. The days that are overwhelming I put worship on while doing school or cleaning. I try to be in a constant conversation with Him through my day. I hope to win this:) It would be so much fun to use all these great products! Thank you for holding this and wanting to bless someone. I always feel like I need to relax. I like to take a bubble bath & read the Bible. I am a homeschooling mom of three young kiddos and feel like we are constantly going and going! My day always seems more together when I start it in the Word. What a great giveaway! Thank you! I need to let go and let others (including husband) help more with the kids so that I have time to relax and renew. Dad is off work today, so I’m going to send everyone outside for awhile! I only relax when I’ve got everything on my to-do list done. That means being careful to not overschedule myself. Being called to the healing ministry, I have been studying very hard to prepare myself for it. I get so much joy out of studying through books, videos, and gleaning information from those who have gone before me. The more I learn about the Lord and His kingdom ways, the more I fall in love with Him! Yes! I need to relax! I think all mamas need to practice this:) I definitely need my time with God daily to help me relax and get my eyes on Him! Thanks for this wonderful give away! Rain keeps me inside, last minute cancellation left me without 3 extra preschoolers. So fixed a cup of tea & sat down with my Bible & Bible Study book. Thank you, God, for this bonus time with you. I so struggle in this area. I spend my day teaching the kids, caring for the home, cooking, and then getting my kids to practices. I always leave myself for last. I hope to refocus myself to better care for me and my relationship with God. As a homeschool mom of 10, I spend my summers relaxing and enjoying a lazy schedule for a few months. Number 3 just graduated from homeschool high school, so I’m using that as my excuse to really scale back the activity around here. Mom needs a break and some time to reflect on all the years we’ve homeschooled. Think about what has worked and what hasn’t, so that I can make any needed changes for the upcoming year. Things that help me when I’m feeling stressed are listening to Christian music, reading the Bible, and prayer. I also love to play the piano and garden. I would love to enjoy this relaxation kit! Essential oils are something I use most days. What is better than tea and a adult coloring book to relax with?? Well put together kit! Putting myself last is definitely what I struggle with the most. When I’m feeling stressed it is always helpful to listen to Christian music, read the Bible and pray. I also enjoy playing the piano or gardening when time allows. This is a fantastic relaxation bundle! Love essential oils and what is better than tea with the scripture books? Strange as it may seem, I homeschooled more in the high school years–tougher material, but great pay off! We had a great Christian grade/middle school, but high school was a challenge, so we turned to homeschool. The comparison thing it the worst joy-stealer!! YOU are the perfect mom for YOUR kids!! What a wonderful package! Love all the coloring books and pens. They have been so relaxing for me, would love to have more! I just finished my first year of homeschooling. This was a stressful year, especially with all the unknowns and the constant self doubting that I am doing whats best for my child. The relaxation items would be a nice way too end this school year, and refresh me for the next year. We’re finishing our second year. It was better, but hard. I try to find small moments to step outdoors and test each of my senses for a few seconds; Do I hear any birds, do I smell flowers or woodsmoke, etc. Need to take more steps, to read, take a bubble bath and just have me time. I need to spend more time in the Word. Living it and drip prayer is where I live, but study is something I have been lacking lately. I really need to make quiet time in the morning a priority. I think today was a breakthrough for me. I was thinking about my years of marriage and bitterness and frustration I feel, the 9 years I’ve homeschooled, my precious four year old and if I should continue homeschooling, circumstances I find myself in . . .needing to fix a lot in a little time. I sat down and wrote a statement. I need to “determine my boundaries in relationships, behaviors, and activities. Streamline methods so I can have optimal success in growing my blessings and transform my attitude to glorify God the best that I can.” When I started analyzing what the Lord has brought me through and what I have been able to accomplish, I realized I am thankful and let go of blame I have been carrying that I have not done enough or was not enough and that is why I am always just doing whatever it takes to get my family and me through. Thank you so much for the way you encourage us and strengthen us . . .your ministry brings training which transforms us and ultimately brings more relaxation for us. I really appreciate you. I just wanted to say how much your honesty and transparency in this comment really encouraged me. Thank you! I could use some time reading by myself to relax. Praying more over my kids. I think my biggest problem is taking care of myself – in all aspects of life. So that is one thing I will definitely have to work on as I start my homeschooling journey with my toddler. So much helpful info- what a cool giveaway! Such creative ideas you have on your blog! I am recovering from surgery last week & trying so hard to be still & heal. Perfect timing for this article, May- the month we all suffer from exhaustion and burnout. Thanks for the encouragement and reminding me, I am not the only one feeling this way. Any hope of relaxing is after the kids are asleep! Relaxing- that’s a hard one. But certainly, trusting in the Lord’s strength to complete the day is a good beginning. One of the more helpful things for me is to say a simple prayer repeatedly throughout the day- like, “Lord Jesus Christ, have mercy on me.” And the second is to pray to God the things I would like to say to my kids (instead of saying them!). I love your blog so much. I find that out of all the blogs I follow, I routinely click on the links in the emails for yours. That is pretty rare for me- to do that. 🙂 Means you have content I WANT to read. Thank you. I love that! Thank you so much for the encouraging words. 🙂 I’m so very glad it’s helpful to you. I definitely need to relax! My friend and I started a Scripture writing challenge today. I think that will help me focus my attention on the Lord. Great giveaway with lovely items for relaxation! Making time for prayer and Bible study always help. Also, making time to exercise helps. I adore time for a bubble bath, or to read a book just for fun. This is an incredible giveaway! Thanks for hosting! That is so good to hear Kellee! 🙂 That’s very encouraging to ME! Yes I need to relax. It has been five years since “inheriting” 6 children. I have been in survival mode and need a time for relaxation and renewal that only the Lord can give. I want to start going to bed earlier so I can get up earlier and devote that time to Him. Thank you for the opportunity to win this awesome prize and the time to think of ways I can get closer to the Lord-the Lover of my Soul. Bless you. Exercising, reading scripture, and listening to music are all things that help me relax. Yes, I could use more relaxation. I say my prayers and think of my Lord every day. Both of my boys have started their summer jobs today. I homeschool so this is some welcome quiet and relaxation time for me. Seems like we moms never take enough (any) time to relax. What a great giveaway! I make sure that every day I’m able to take a few minutes just for me. Seems like we moms don’t take enough (any) time to relax. What a great giveaway! I wrote scripure down on paper and taped it to the wall in the bathroom. When I have a quiet moment to myself in there, I read the scriptures. I also read my Bible or a devotional while my kids are reading their Bibles in the morning. On nice days, I go outside and sit and take in God’s creation all around me. I will also talk to Him. Yes! I need to relax, but I think I need to relax in the way that people might not think at first for a young mom. I think I do relax and have quiet time to myself but I need to mentally relax. Even when the house is quiet in the afternoon, I am mentally “working” thinking of all the things I need to do or working at things online. Even when the house is quiet in the afternoon, I am mentally “working” thinking of all the things I need to do or working at things online. Mentally relaxing is hard for me. I struggle with finding time to relax at a decent hour. I tend to pull a very late night just to be alone. I often am doing more housework instead of something for me. I do add in audiobooks while I fold clothes, wash dishes, etc. As far as time with the Lord, in this season of life, I have to grab the moments that I can. By starting the day with prayer & reading Gods word helps me stay focused throughout the day. Reading & mediating on Gods word helps to keep me focused on my relationship with the Lord every day. Needed this article. Lately I feel like a complete homeschool failure. I don’t think we are were we need to be and the fighting to get the work done stresses me out. Thank you for the encouragement. I have to remind myself often to relax and go with the flow. I’m a planner by nature, but hubby is not and with 3 kids that can equal a lot of stress. Some of the ways I relax is getting up early with a cup of coffee, some quiet Bible time and book reading. And learning to let go if it doesn’t happen it’s okay life goes on. I have been struggling with putting myself last and just plain not taking care of myself. A few weeks ago I put waking up early to spend time in God’s Word back on the front burner. I changed it up a bit though by staying in bed to do it! Seriously! I set my alarm and keep my Bible, journal that I use during my Bible reading time, and pen right there on my nightstand, so I don’t even get out of bed and thus invite the distractions. No deciding to make a cup of tea first, no worry about the kids waking up because they hear me, etc. It’s been working! I also have been keeping my iPad on my nightstand so my son (age 5) who inevitably knows I’m awake can snuggle in bed, too, and play on there (muted) while I still get my special time. A wonderful first step, but I still need to keep at it. Regardless of whether I win or not, I recognize my need to take time for all of me (body, mind, soul, and heart). Thanks for the chance to win! Love this! Blessings to all! Great article! Thanks for reminding us moms to take time for ourselves! Some days are definitely better than others. Thanks for the info. Sometimes I just need to take a deep breath, be still in His presence and go back to His word. His promises are true and never ending! Great post. Thanks for the reminder. This giveaway lookd so awesome! I need to be more consistently in the Word. There is no higher power than God. We must trust and teach our children how to grow thru his eyes. Miracles happen everyday. Bless all for this lovely treasure of gifts. Thank you for another great giveaway! I love Proverbial Homeker!! I read my bible and knit. I have to make time for me alone or I go crazy. I like to crochet for my relaxation. but I should also relax more in the company of my Lord. Thanks for offering this giveaway for us weary homeschool moms! We all need to take more time to relax. I love to color with my grandchildren. It would be fun to bring my own to the party. This article really came at the right time. Sometimes, I do everyone of those things. My daughter & I had a good talk this morning about some changes. Thanks, Also, thanks for putting together the giveaway. The products look amazing. The essential oils and prismacolors are my favorite 🙂 Thanks so much for the opportunity! My goal is to spend time with the Lord in the am and exercise/walk every day. But I’ve struggled to be consistent…. But I’m not giving up–I’m also working on diet, just eating whole foods. I stay away from gluten and dairy because of intolerance and inflammation. I am still trying to learn how to care for myself in the midst of busy family life. But I am getting better! It has been a busy year, but a good one. I am looking forward to a long, relaxing summer. This giveaway sounds wonderful!!! I try to do yoga when I need to relax. Meditating helps to focus on my journey with the Lord. Thank you for the reality check. I probably fall into all of the traps at least once a week. It is good to know it is normal and that I don’t need to give in to them! I have always struggled with comparing myslef and my children with others. Thanks for the reminder to n9t listen to the lies. I actually struggle with a lot of those issues…I have 6 children and am homeschooling 5 of them at this time. The youngest 2 are both blind/visually impaired and have developmental delays (mostly due to spending too many years in orphanages). I also have a high-schooler with some learning disabilities, and I really worry at times about her graduating and her future. Then throw 3 more in the middle….The biggest struggle I have is not feeling qualified to teach the 3 with disabilities and finding time to just breathe some days. What a fantastic giveaway! All moms have our own reasons for needing relaxation. Mine include homeschooling, adopting a child, and writing my dissertation…all of which are blessings in my life, but can sometimes be the sources of stress as well. It’s so important to take time for self-care, and that’s not something that moms (including myself) often remember. Thanks for the reminder! I am a homeschool mom. I need to make way more effort to get up before the kids to have my quiet time and get myself set up and organized for the day, everyday. I am a night owl rather than a morning person so it is definitely a challengr for me but when I make an effort my (out) day goes much smoother. I also sometimes forget to take ‘me’ times and pamper myself a little. I always feel much better after. I very certainly need to relax. I’m juggling a lot of “plates”, and I have trouble letting go of the many things that need to be done. I spend a lot of time running through the things that need to be completed, solved, or otherwise dealt with. I have the “too many tabs open” problem, and my brain never seems to stop. My child is only 2 and we haven’t begun homeschooling but this is excellent advice for any stay at home mom! I always enjoy your blog posts, thank you! Such great advice! I am homeschooling 7 children and have 2 under school age. It is so easy to fall into any of these traps. I was just recently able to sit down with some fellow homeschooling moms for a time of encouragement. I was able to start this week feeling renewed. Prayer is such a vital part of our journey as homeschool moms too. Thank you for sharing! This is a fantastic giveaway, thank you to all the sponsors. With my crazy, hectic schedule I rarely get time to myself and these few things sure would be nice when I do get a moment. I am homeschooling 5 out of my 7 kids. The other 2 are just young . I could totally use the relaxation helpers. The coloring books, coloring pencils, tea, and essential oils would be such a blessing. I am a Lilla Rose consultant so I could pass Clarissa’s gift on to others or bless her back somehow. My children are growing so fast and our house is small so some extra relaxation helpers would bless me more than I could say! Love the encouragement! Thank you so much! God bless! Thank you for a great article and an amazing give away. Just like so many others, at this time in my life this relaxation kit would be so beneficial. I try so hard to start my day in devotions and look for reminders throughout the day of His Love., just so easy to get wrapped up in busyness. Thank you for the chance to win this relaxation package. Just completed 2nd year of homeschooling with my oldest (6)…and will begin homeschooling middle child (4)…next year…and have one not quite 2 yet. Definitely need to relax. Two of my children have special learning needs, and I often worry that I’m either not getting them to learn “enough” or that I’m pushing them too hard. But when I relax and just let the process happen, it’s amazing what they accomplish! What an amazing giveaway! I know some fellow mamas that could use a little pick me up and these are great! It would be a blessing to win this. I love the oils! That is how I relax a hot bath and essential oils. I homeschooled briefly when my children were younger, and yes, definitely need to relax! I find that just relaxing on the laptop, listening to praise and worship music and praying off and on through the day helps me. When I can get a moment to myself…. Thanks for the giveaway. What a beautiful, thoughtful package! I would love to pick coloring up again…it’s so relaxing. I’m just starting to learn about essential oils. My children gave me a diffuser for my birthday…now I want to branch out. Anyway, I loved this post. We have homeschooled for 16 years so far and are down to our last 2 (ages 17 and 10), and I’m still learning. I find I haven’t been as faithful with my Bible study or prayer times as I used to be, and I know that needs to change. We can’t build our homeschools on sand,mthats for sure. Your posts are such an encouragement to me! Thank you. I’m so glad it’s encouraging! 🙂 Have fun with your new diffuser. It’s always on here! Thank you for the give away. Will definitely be a blessing to the winner. Yes. I need to be better at just unplugging and focusing on myself. Reading my bible, baths, sitting on the back patio. I do really need to relax some! It’s so hard to remember to relax when there to do lists never end! Would love to win this! Every morning I wake up, have a cup of coffee and do scripture writing in a journal. I also crochet or color in a devotions coloring book. The best way I relax and refocus on the Lord is to turn on worship music and turn off all other distractions. Yes! I need to take time to stop, breathe, and pray all through the day. Thanks for the great giveaway. I am feeling the end of the year stress, lol. I need to do beter and show the kids how we use Gods word every day, we all write our weekly verse down and put it up for each other, I have started technetium them to use color in there bibles for notes, my daughter loves it, my son, has not decided if he likes it or not. I’m not a homeschooling mom, either. Although I try to work with our oldest as much as I can. So free printables are PERFECT for us! I currently work outside the home and we are pretty busy in general. We are facing a time of change that is going to be very difficult for ALL of us. I have so enjoyed your blog and the group. Thank you! I am not a home schooling mom either. I currently work outside the home and we are just busy in general. I do try to work with my son on my day off as much as I can. So free printables are where it’s at for us!! We are facing a time of change that is going to be very difficult for my entire family. So sign me up for anything that offers even an ounce of relaxation! Thank you! What a great giveaway! Thanks for your wonderful blog, I really enjoy reading it. I have have been really struggling this last week, wondering if we made the right decision to put our son in school at our church. I do feel as though I failed him, because we just were not able to work together without discord and I couldn’t take it anymore. He’s done so well, and wants to go back, and all I want is for him to be at home with me. I’m praying, and God is gently speaking to me. A little TLC for this summer. This would be a wonderful prize package. Thank you for the chance to win. Go on a walk with my husband. I am a mom of 6 and we homeschool. I definitely need my relaxation time! I like to read and garden. I’m the Mom of three boys, the oldest of which just happens to have Down Syndrome, ADD, OCD and ASD. His abilities range from the 2 year old level up to his chronological age of 22. I often joke that I have 3 physical boys and 20 spiritual boys as he can be functioning at 2 one second and any level in between that and 22 in the next. (Oh, that doesn’t include his 3-4 invisible friends that hang out at our house all the time.) This relaxation kit would be just what the doctor ordered. I could use some relaxation! I find my day goes much better if I just stop and ask God for help and guidance. Looks like an amazing giveaway! Love the coloring books, and I would love to try the oils! Relax?! Is there such a thing with 4 kids (9, 7, 2, 3 months)? There is always a voice calling Momma. I like to relax by reading. To connect with God I am spending about an hour in the morning reading Scripture and praying. This is my first official year of homeschooling. Definitely need a way to relax! Finding time to relax is the most difficult. After the kids are in bed, my husband and I clean and get ready for the next day. I suppose my morning prayer time is relaxing and the best way for me to grow closer to the Lord. The best time to relax and be with the Lord is before you get to the point that you are crying out in frustration. Just like our children go to doctors for preventative care , so do we need to go to God when we are doing well, when we don’t feel stressed or lost. I have just started coloring again and it’s definitely a long-forgotten pleasure. I’ve been using essentials oils for a couple of years and they are such a joy. This giveaway is truly going to bless someone. Thank you for sharing. Went through all of this. I’m trying to spend time each morning with Jesus plus learning to rest in Him. I’m struggling with seizures while still making a home and teaching my kids…it’s been hard, but God is faithful. I need to trust that the teenagers will get things done, even if they don’t do them exactly as I would have done. Thanks for the reminders… I need to focus on God’s priorities for me and my family, instead of comparison with others. Meditate, relax, go outside and find your time. Having time to relax is a luxury. I would love to relax. But those 5-10 minutes in the morning when I pray and grow closer to the Lord is a necessity otherwise I might not make it through the day! We recently moved across the country with 5, 4, & 1yos. I am trying to figure out whether or not to homeschool. I really miss my ladies Bible study group and it’s tough finding a group here since everything is already ended for summer. Sometime it helps me focus on God if I take a walk and pray. But, one of the best ways is to read His words in the Holy Bible. Yes, I do need to relax! I know the way I can accomplish that is to rest in the Lord daily. I need to spend intentional time with Him so I can be refreshed everyday. Silly question after the truth and seriousness of what you wrote…is the picture of the bookshelves at the top of the post yours, or just some random shelf? I am interested in the plan to make those! Do you need to relax? What steps can you take today to focus on your relationship with the Lord? Yep, definitely need to relax–two little kids, homeschooling, work at home part time, live on a hobby farm…and I’m not complaining, I like it, I’m just often wound up tight and exhausted. I’m trying to make sure I pray throughout the day and don’t wait for “quiet time” because sometimes that just doesn’t happen. With 8 kids (the youngest in diapers all the way to the oldest in his first year at college), I could use some relaxation! I need to be memorizing scripture more, so I can bring verses to my mind in those moments that I need them! I’m a pastor’s wife so a relaxation package would be wonderful! Thanks to your essential oils course I found out about RMO & ordered some. Thanks for the course and your wonderful printables. I appreciate you offering the printables in KJV. With a husband that works 80 hrs a week, and having a 50-60 hr wk job myself, this would be a great way to sneak some relaxation in! I am working towards Journaling with daily scripture reading. Finding and making quiet time with the Lord a priority. I had cataract surgery yesterday so I am trying to relax and heal and asking the Lord for his help. Thank you for your encouraging thoughts you share with all of us! I am a homeschooling mom of 7 (ages 1 – 14 ) I am a second generation homeschooler, yet still have the same struggles with believing lies that Satan tries to get us to believe. So your blog is one of the things that helped me to keep going as it encouraged me to keep my focus on Christ, especially in this last school year. (I greatly battled postpartum depression since having my last little one. ) I was glad to see your post on essential oils for hormonal imbalance and such. It’s helping me as I am finally starting to cycle again. That, and much prayer!! I listen daily to K-Love’s beautiful Christian music, so encouraging and keeps me close to the word too, thanks! Yes, I need to relax! I need to learn to not try to do everything on my own, to ask for help when I need it. I need to relax. I am a home stay mom and will be homeschooling. I have a almost 5 year old son and a one year old daughter. My one year old is attached to my hip and only wants me most of the time. I don’t get much time to myself. I find myself getting burned out. This would be a huge blessing. Jesus is my source of strength. I wouldn’t be able to do it without Him. I think what would really help me is to wake up early and have some prayer/quiet time before the kids wake up, but that means first working on my evening routine so I can go to bed earlier! I missed my quiet time this morning because the family got up when I did so I don’t know that I was as focused on what God wanted me to do today. Yes, I think I could use some relaxation. It’s been a stressful year, my husband and my father both passed away within two months of each other. With a society that is so bent on being plugged-in, with demands for our attention and time, and with the advent of social media, we are a people in need of practicing how to rest…especially finding peace in our Lord. Any and all attention to this matter is important if we are going to be still and know that HE is Lord. Thank you for such a wonderful opportunity to win tools to help us rest!